Nestled in pristine jarrah forest, individual chalets are surrounded by natural bush, offering privacy and tranquility. Drink the spring water, breathe the fresh air, sit back and relax. Each quality chalet is fully self contained, complete with DVD / VCR player, crockery, cutlery, fridge, microwave, gas cook top and gas barbecue on your verandah. Sleep well in comfy beds with crisp white linen, throw rugs, electric blankets and doonas. Enjoy a relaxing bath with fluffy towels and luxury hand made soap or bring your own favourite bubble bath. Watch flames flicker in the wood burning fire, providing warmth and atmosphere for a cosy winter getaway. 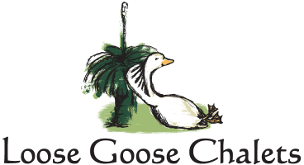 The Loose Goose Chalets are hidden in 42 acres of private property and surrounded on 3 sides by State Forest. If you like bush walking or mountain bike riding, the Old Timberline Trail meanders past the back boundary and the Munda Biddi trail now comes through Nannup. There's great food in Nannup's cafes and restaurants. Why not visit the Mythic Mazes, play Putt Putt, try some sheep cheese or traditional cheeses, go canoeing on the Blackwood or venture to the coast for some fishing, bring your bike and ride the Timberline Trail or Munda Biddi. There are entrancing craft and homewares shops and Nannup is the very heart of the south west - a great base for day trips around the region. In summer (or for the brave in winter), it's a short drive or pleasant walk to the Blackwood River for a refreshing dip at Barrabup Pool. Things to see and do include checking out the wildflowers in Spring, various wildlife from kangaroos, and emus to over 70 species of birds in the area. Come and meet our family; the geese, peacocks, ducks, chooks, goats, sheep, alpacas, donkeys.... and more. Our happy dogs, Bandit and Missie, will fetch a ball or play soccer with you. There is also table tennis, board games, bocci and open space to kick a footy or hit a 6. After dark, count the myriad of stars in the clear skies or do a night stalk to spotlight possums, owl and kangaroos.